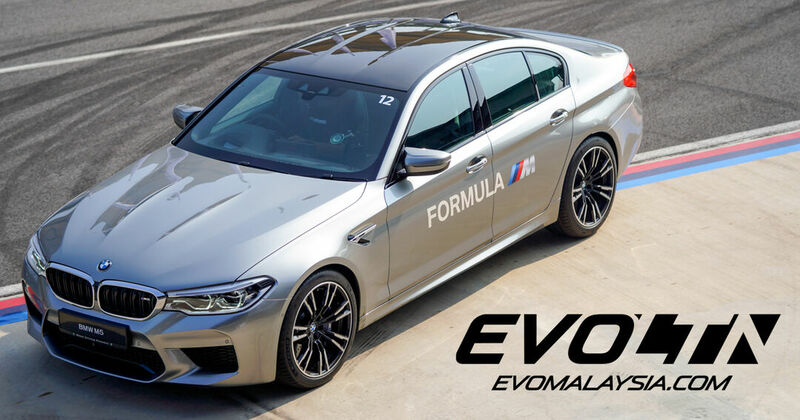 BMW marked the all-new F90 M5’s arrival in Malaysia with a track day and let us loose around Sepang in Munich’s sixth-generation super-saloon. he most powerful letter in the world. In the world of BMW, M is a symbol of the company’s proud motorsports pedigree, a manifestation of unrivalled performance be it on road or on the track. Recent political local developments have also given the letter M added significance in the Malaysian context and it ironically still links in to theme of dynamism and power to the people. ‍‍‍Against the backdrop of political chang‍‍‍e in our country, the all-new M5 similarly arrives with fundamental chang‍‍‍es to its age-old formula; though the underlying objective and essence remains the same – the deliverance of supercar-slaying performance within the humble shell of a four-door sedan. As before, the M5 is powered by a 4.4-litre twin turbo V8, but mechanical similarities with its predecessor end there. With great power comes great responsibility, and BMW M engineers had to revamp the M5’s mechanical template to cope with the uprated engine’s enhanced outputs of 600PS and 750Nm. The predecessor’s 7-speed DCT makes way for a hardier 8-speed torque converter auto and the front axle now takes on the added responsibility of helping the rear out in deploying traction to the road. Fret not though, if you still want to indulge in your drifting shenanigans, the M xDrive system is rear-biased, and you have the option of switching off if it so tickles your fancy, but be warned, you can’t do it without switching the traction control off as well. From the outside, the new M5 resembles a beefed up 530i M Sport. The lights are same, but the vents are enlarged, and body panels flared wider for a more aggressive stance. A carbon fibre roof comes as standard and left proudly unpainted. Inside, the M5 is all business; its cabin broadly sporting the functional cabin of the base 5 Series, but with distinctive touches that set it apart from its garden variety siblings. Conspicuous markings of red amidst a sea of alcantara and carbon fibre-weave panels communicate sporting intent in no uncertain terms. It is a technological powerhouse too, one that offers near-infinite possibilities of fine-tuning of its characteristics at the complete whim of the driver – weigh up the steering, stiffen the suspension, dial up the throttle response, take your pick. The two conspicuously red buttons on the steering wheel allow you to recall your two favourite selections of settings at the press of a button. Whichever way you set it, however, there is no hiding the fact that the M5 is a monster of a car. BMW may have clothed it in a sharp suit, but you just know that under the mild manners of Bruce Banner, lurks the Hulk’s brutal strength. In most conditions, the M5 is as refined and as civilized as you’d expect from a regular 5 Series, but flexing your right foot a little bit more demonstrates the supersaloon’s capacity of gathering speed with ridiculous ease. There is no forcefulness, no brutal punch, just relentless and unflinching acceleration as you‍‍‍ hold your foot against the throttle and realizing that there is still quite a bit of travel to go before you reach maximum opening. Flinging the M5 around corners is as much an exercise of trust as it is an examination of your cojones; the re-engineered chassis in conjunction with finetuned electronic controls of its M xDrive all-wheel drive system somehow all working together to keep two tonnes of metal tracking your chosen line. The suspension lets a bit of body lean, but chassis just stubbornly clings on as your right foot judiciously applies the throttle. ‍‍‍Driving the M5 back-to-back agai‍‍‍nst smaller M models such as the M2 and M4 exposes the larger car’s aloofness and not inconsiderable bulk. Lapping our very own Sepang Circuit, the M4 was simply more incisive around corners, more responsive on the throttle, and simply livelier a car as a whole. No doubt the M5 is a faster car on all counts, but the M4 gives you more communication, and thus more confidence to explore a greater portion of its capabilities. The M2 is even more impressive. It was the slowest car on a straight line that day, but also the most fun and balanced. There is a sense of playfulness in the chassis that makes it such a delight to hurl around corners, its tail slowly but surely inching out to help point the front more accurately past the apex. You barely need a lap before you are fully convinced to trust the car with your complete confidence; so much so that the upcoming Competition variant that ups the car’s power levels to M3/M4 levels suddenly seem to make so much sense. This diminutive chassis has the capacity to handle significant amounts of power. As the winds of progress continue to blow, the BMW M5 finds itself on an inevitable upwards trajectory, every successive generation continuously squeezing out increasing amounts of power in a bid to stay ahead in the performance arms race against its rivals from Stuttgart and Ingolstadt. But as the engineers dial up the boost levels, also comes the necessary bulking up of the car’s chassis and electronics to take the added power; the result therefore, is an unavoidable trade-off of the intimate feedback and delicate handling that earlier iterations of the car were renowned for. Still, the new M5 is a devastatingly capable car. The execution has moved leaps and bounds from the ones that preceded it, but the underlying premise remains the same and convincingly delivered: a crushingly fast 4-door saloon that blows away supercars whilst cocooning you in sheer luxury. "As before, the M5 is powered by a 4.4-litre V8, but engineers had to revamp its mechanical template to cope with enhanced outputs." "If you still want to indulge in your drifting shenanigans, the M xDrive system is rear-biased, and can be switched off." "Under the mild manners of Bruce Banner, lurks the Hulk’s brutal strength." "The M5 is a car that makes going fast supremely easy, with vast reserves of pace and grip at its disposal"